My Gnome must have been eating psychedelic mushrooms! 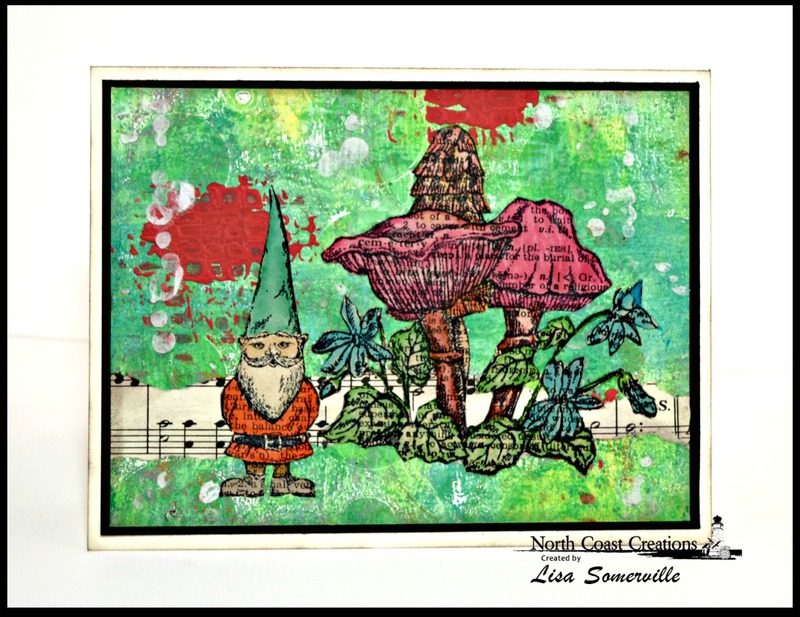 I had fun creating my card using the Gnome What? stamp set, stencils from Just a Trace, paints from the DecoArt Mixed Media line, the Gelli Arts Plate and color mediums from STAEDTLER. Before I share the "how to" of my card, I wanted to let you know the North Coast Creations and "sister companies" Our Daily Bread Designs and Artistic Outpost are all offering FREE SHIPPING through tonight, Sunday, October 5, 2014 11:00 PM EST. Free Shipping is for Retail Customers only, no code is needed. International Customers will receive $5.00 off shipping. The background was created using the Gelli Arts Plate and DecoArt Mixed Media Paints (Hansa Yellow Light/Cobalt Teal Hue/Titanium White) along with the Dottie stencil from Just a Trace. Once the background was dry, I applied DecoArt Modeling Paste through a stencil to add texture and also some DecoArt Traditions paint in Medium Red Rose for added interest. I placed a torn strip of music sheet to the background panel adhering with DecoArt Matte Medium. 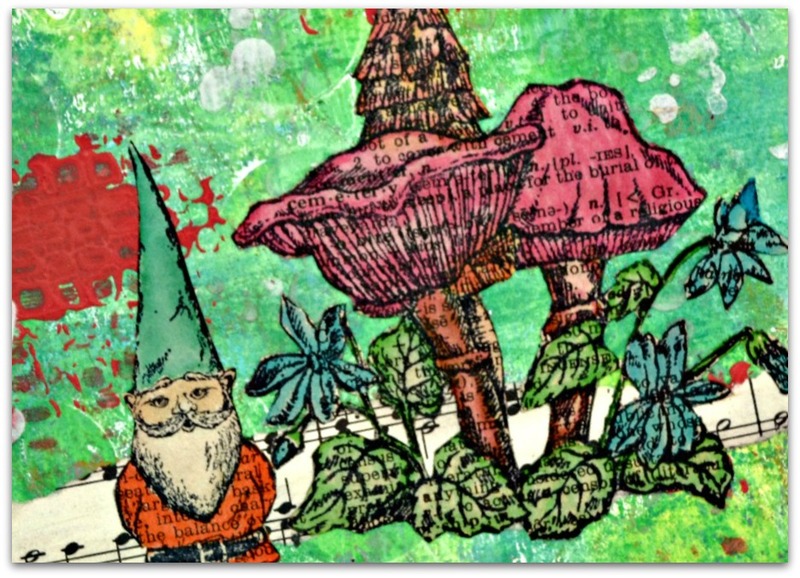 The Mushroom Collage (I omitted parts of the stamp) and Gnome are stamped on pieces of old book paper and colored with STAEDTLER Mars Graphic Markers, then adhered with DecoArt Matte Medium. 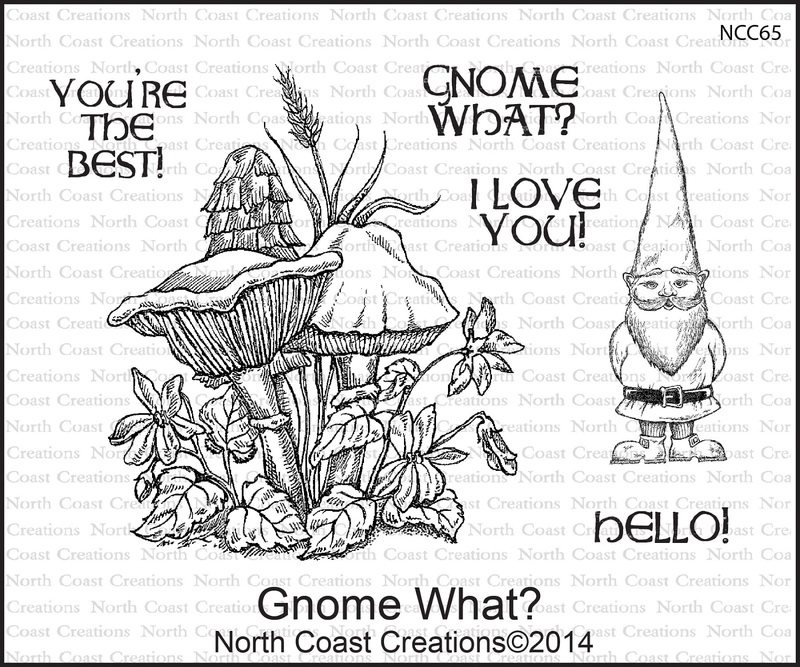 Stamps - North Coast Creations Gnome What? So cute Lisa!!! I love the mix of colors! Very cool! Wonderful, Lisa! Love your colorful gelli plate bg & text bg. Love the Christmas nome! Beautiful bacground! Look at those fantastic shroomz. This is awesome! I gotta get me some of those mushrooms! Wish you would consider making a video of it some day....hint, hint! It's really cool looking! clever you! love your mixed media card!! so cute!